2-family house "Robert". In the hamlet Antonci 3 km from the centre of Poreč, in a quiet, sunny position, 4.5 km from the sea. Private: property 70 m2 (fenced), swimming pool (5 x 3 m, depth 140 cm, 04.05.-28.09.). Arbour, garden furniture, barbecue. In the house: internet access. Parking at the house on the premises. Shop 2 km, restaurant 3 km, pebble beach 5 km, rocky beach 5 km. 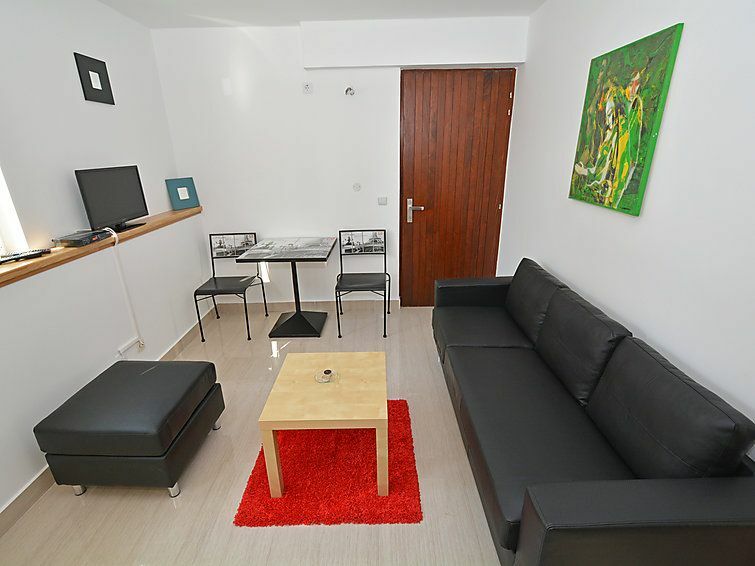 Golf course 4 km, tennis 4 km, walking paths from the house, cycle lane 500 m.
2-room apartment 31 m2, on the ground floor. Living/dining room with 1 double sofabed and satellite TV (flat screen), air conditioning. 1 room with 1 french bed (160 cm, length 200 cm). Exit to the terrace, to the swimming pool. Open kitchen (4 hot plates, oven, microwave, freezer, electric coffee machine). Shower/WC. Terrace 4 m2. Terrace furniture. Facilities: washing machine, hair dryer. Internet (WiFi, free). 1 small pet/ dog allowed.